It took all of 38 seconds for the Syracuse Crunch to find the back of the net Saturday, but it was all downhill from there. Seeing Brett Connolly and Alex Killorn crashing the net, Cory Conacher threw the puck on goal. After banking off one of the Wilkes-Barre Scranton Penguins defenders' skates, it slid past goalie Jeff Zatkoff. "That was one good bounce we had all game," Conacher said. Despite the large void the NHL lockout created, the hockey season is already long underway. Various amateur and professional leagues throughout North America and Europe have wrapped up their preseasons and are set to begin or are already in the thick of regular season action. 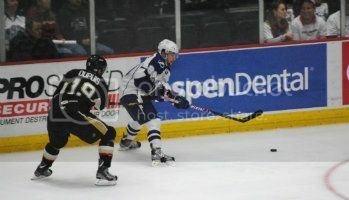 The Lightning's new AHL affiliate, the Syracuse Crunch, open their 2012-2013 season tonight with an impressive roster that boasts the nucleus of last season's Calder Cup-winning roster and an infusion of talent with varying professional experience: (J.T. Brown, Brett Connolly, Danick Gauthier, Riku Helenius, Dmitry Korobov, Vladislav Namestnikov, Jared Nightingale, Matt Taormina and J.T. Wyman). In the absence of big-league action, watching much of the (currently foreseeable) lifeblood of the Lightning's future skate and bond together is a much-welcomed tonic. Should he stay or should he go - part three. According to today's Tri-City Herald, Lightning General Manager Steve Yzerman is talking with Tri-City Americans General Manager Bob Tory about returning top Lightning prospect Brett Connolly to the Western Hockey League. The Lightning are still undecided about what to do with their 2010 first round draft pick, the Herald reports. "I've been in conversation with Steve Yzerman, but they have until [February] 27th to make their decision. We'll see at that point," Tory told the newspaper. Connolly, who was the subject of the Lightning's "stay or go" debates coming out of training camp and before the World Junior tournament, has averaged around six minutes in ice time with the Lightning this season. Last night against the Sharks he was on the ice for 6:40. He began the year earning more than 10 minutes per game. Drafted because of his high-end offensive abilities, Connolly has just nine points (four goals) in 43 games with the Lightning. He has been learning the defensive side of the game with the Lightning, but still isn't to a point where coach Guy Boucher appears to trust him in the third period of close games - as reflected by his ice time. Norfolk Admirals coach Jon Cooper, who no doubt would love to have Connolly in the AHL though he is too young, told Bolt Prospects in training camp that the best level for a prospect's development is the one where he's playing the most. He also said winning plays a promenant role in a player's growth. Connolly can't join the Admirals until Tri-City is eliminated from the playoffs. With Dominic Moore now out of the Lightning lineup and the Lightning putting up a "Sellers" sign at the trade deadline, conventional thought is Connolly's ice time will go up. It's early, but he remained at the same level Thursday night. If his ice time doesn't go up, one would expect Connolly to be sent back to juniors to play with the Americans deep into the playoffs. Tri-City is currently the second seed in the WHL's Western Conference and is tied with Portland for the third most points in the league. Being sent to Kennewick would allow Connolly to play in the role for which he was drafted - a top-6 forward where he's relied on for clutch scoring. It would also help him maintain his identity as an offensive player and further build his confidence going into next year's Lightning training camp. From all reports it's been a great learning (and financial) experience for Connolly with the Lightning, but class may be over soon. Closing in on being able to declare a successful road trip. Mathieu Garon was dazzling, stopping 26 of 27 for the victory, including several key stops in the final 10 minutes of the contest to preserve the victory and the 2 points. Steven Stamkos and Garon were the game's first and second stars. Through two periods, I thought Stamkos was worthy of sweeping all three stars the way he played. His line's been the best the past two games, after Marty and Vinny upped the ante in the couple of games before that. They certainly did it the hard way by holding on by a fingernail at the end, but the Lightning are about 1 point away from having a successful road trip with 1 game left to go, and at least giving themselves a chance heading into the second half of February. They're 8 points back of Toronto, who got pounded tonight by Montreal, for 8th in the conference and 9 points back of the Panthers in the division. The Lightning have 4 games in hand on Ottawa, 2 on Toronto, and 3 on Winnipeg, and they've got a lot of head-to-head games against those 3 left on the schedule. The Lightning don't have any games in hand on Washington, but they do have enough head-to-head matchups left to make it interesting on the Caps. Florida has to help out the Lightning by imploding to give Tampa Bay hope of catching them. The Panthers did a lot to stabilize themselves by beating the Caps and then by beating New Jersey today, so that situation looks less rosy than it did a week ago. Brett Connolly played 7:26 in the game. Congratulations to Brett for graduating from prospect status on Bolt Prospects, as tonight was his 41st NHL game of the season. J.T. Wyman had 2 penalty minutes in 8:47.